A Palestinian young man was wounded in Beit Furik village, east of Nablus city, on Tuesday during confrontations between Israeli occupation forces (IOF) and young men in the village. Local sources told the PIC reporter that Munther Khatatbe was injured in his hand with a rubber-coated bullet in the clashes that took place at Beit Dajan junction. 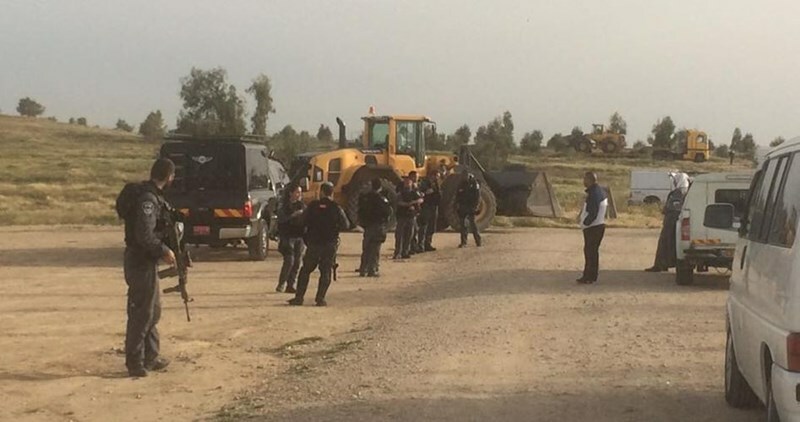 They said that the confrontations erupted after the IOF soldiers were leaving Beit Dajan where they had delivered demolition notifications and confiscated a tractor. Israeli bulldozers on Tuesday morning demolished the unrecognized Palestinian village of al-Araqeeb in the Negev for the 96th consecutive time. According to local sources, a police car belonging to the police unit, Yoav, stormed the village in the morning before bulldozers showed up later to carry out the demolitions. Since 2010, the impoverished village, which is unrecognized by Israel, has been razed dozens of times. Sometimes with the help of activists, the Bedouin villagers were able to rebuild crude homes and structures following each Israeli demolition campaign. Israeli forces stormed the campus of al-Quds University in the occupied West Bank village of Abu Dis east of Jerusalem's Old City early on Tuesday morning, damaging property, local sources told Ma’an. Israeli troops raided the university campus at 3 a.m. and left at 5 a.m. For two hours, the soldiers locked campus security guards in one room after breaking their walkie-talkies. The soldiers then ransacked a building hosting the Dean of Students and destroyed property, including printers. The sources added that Israeli forces damaged a Christmas tree that was standing in front of the Dean of Students office. the students activity center, destroying material in an exhibition students were working on. An Israeli army spokesperson told Ma’an that as part of “operational activity,” Israeli forces seized material belonging to Hamas’ educational arm al-Kutla al-Islamiyah, including propaganda for Hamas. Both Palestinian and Israeli leadership have accused each other of inciting and encouraging the current wave of upheaval in the occupied Palestinian territory and Israel that began in October. Israeli forces have stormed university campuses across the occupied Palestinian territory several times since the beginning of 2016, with al-Quds University in particular finding itself a focal point of violent clashes between Palestinian students and Israeli soldiers. Hundreds of Israeli soldiers stormed al-Quds University in January, confiscating equipment and documents belonging to its student union. Earlier that month, Israeli forces also confiscated and damaged equipment at Birzeit University in a predawn raid. In March, Israeli forces raided the Tulkarem-area al-Khadoori University twice in 18 hours. The Arab American University in the occupied West Bank city of Jenin was also raided by Israeli forces in March. 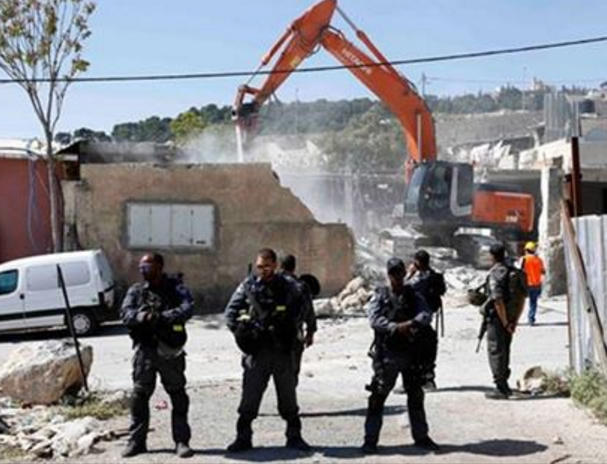 The Israeli Occupation Forces (IOF) demolished Tuesday morning a Palestinian building in Beit Sahur town near Bethlehem under the pretext of being built without permit. Beit Sahur mayor Hani al-Hayek affirmed that Israeli forces demolished today morning a building belonging to the Beit Sahur municipality for allegedly being built without Israeli permit in Area C.
The demolished building is composed of five commercial shops and used as poultry slaughter, the mayor explained. Al-Hayek denied Israeli claims that the building was established in Israeli-controlled Area C, affirming that it was built within the municipal area. The Oslo II Accord divided the West Bank into three administrative divisions: the Areas A, B and C. Area C is under full Israeli control. The Israeli-controlled Area C, under full Israeli control, constitutes about 60% of the West Bank. All construction within Area C requires approval from the Israeli Civil Administration. Many Palestinian villages and communities are banned from getting permission to carry out investments in infrastructure, like repairing roads and the electrical grid or laying pipes to connect to water supplies. Israeli occupation bulldozers on Monday evening demolished four Palestinian residential structures in southern Jericho city. Local sources said Israeli bulldozers razed four residential barracks in southern Jericho, to the east of the occupied West Bank. The demolished structures are reportedly owned by the Palestinian civilian Muhammad Shahdeh al-N’joum. Jericho governor Majed al-Fetyani said the demolition, carried out as part of an Israeli policy of ethnic cleansing, shows that the occupation government is far from being keen on peace. 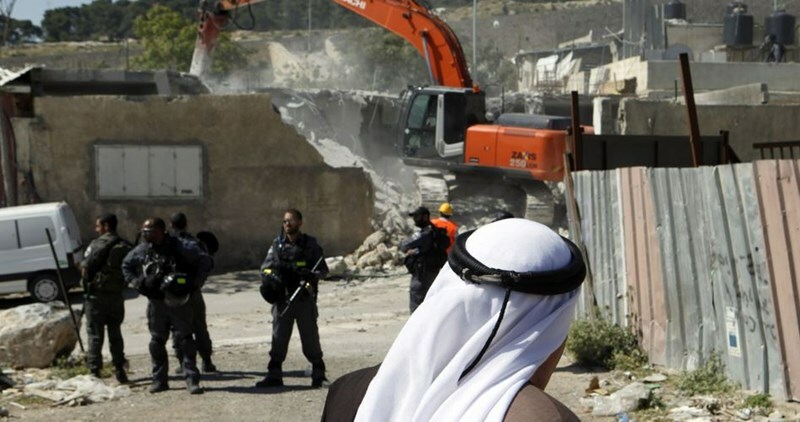 Al-Fetyani called on the international community to rise up against Israel’s arbitrary demolitions of Palestinian homes and cold-blooded slaughters of civilians under counterfeit pretexts. 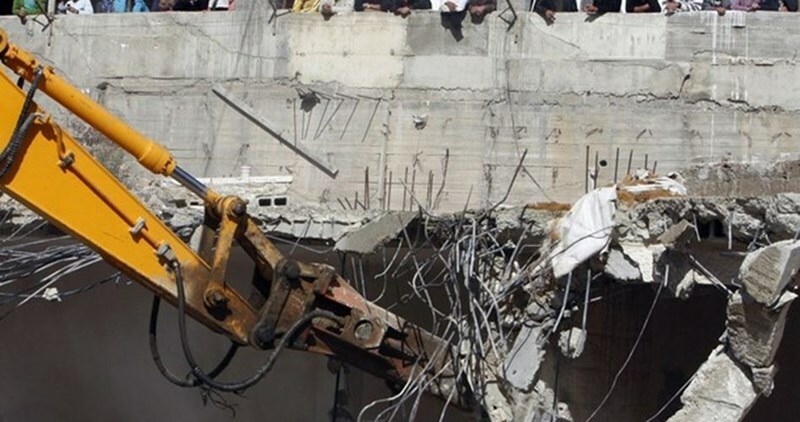 Earlier, at dawn time on Monday, the Israeli occupation army knocked down a commercial structure and a civilian home in al-Khalil province along with three more homes in southern Nablus and three others near Jenin city. 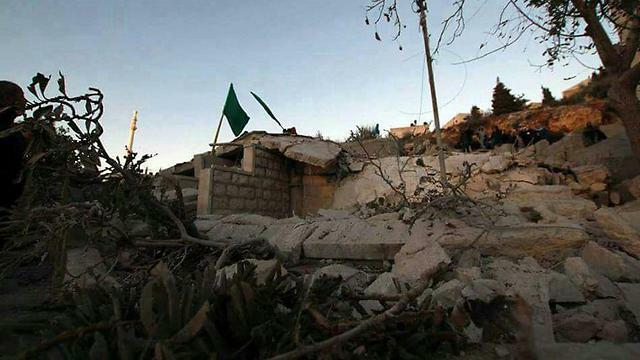 Another Palestinian home under construction in Occupied Jerusalem was also subjected to an abrupt demolition process. 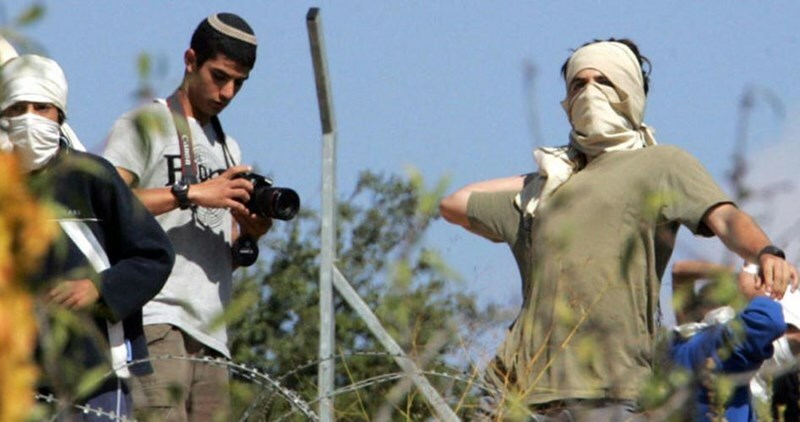 The Israeli occupation authorities (IOA) on Monday sealed off large areas of Palestinian lands in Nablus at the same time as Israeli settlers attacked Palestinian farmers in the city. 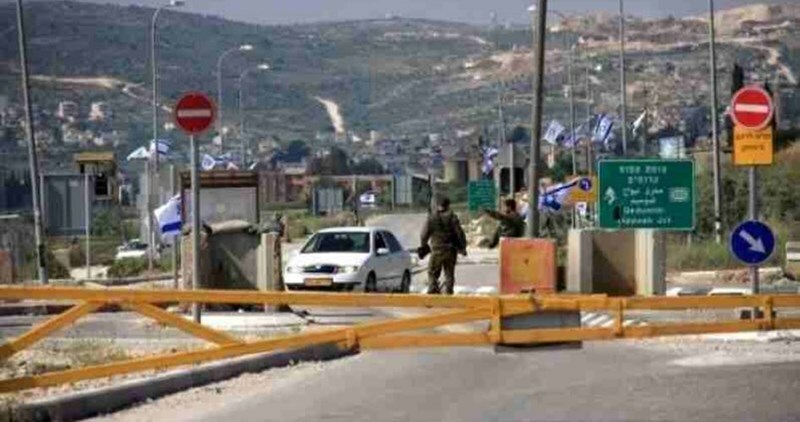 A PIC journalist quoted member of the Qaryout village council, in southern Nablus, Bashar al-Qaryuti, as stating that Israeli civil administration crews escorted by the occupation army sealed off large tracts of Palestinian lands in the area. Anti-settlement activist Ghassan Dughlas said the Israeli occupation bulldozers destroyed an agricultural road leading to confiscated lands in southern Qaryout. The occupation soldiers pitched sand barriers around the targeted lands, which reportedly cover hundreds of dunums, so as to block Palestinians’ access to the area. In a related context, Israeli extremist settlers aggressively attacked Palestinian farmers in Ourata town, to the southeast of Nablus, while they were cultivating their lands near the Israeli illegal settlement of Elon Moreh. Locals said at least three farmers were subjected to heavy beating and insults by the Israeli vandals. A 12-year-old child was hit and seriously injured with a rubber bullet in his head as clashes erupted in Issawiya town northeast of occupied Jerusalem on Monday evening. The child was immediately transferred to al-Makassed Hospital to be then moved to Hadassah Ein Kerem Hospital due to his serious health condition. The clashes broke out when Israeli police forces brutally stormed the town amid heavy fire of teargas bombs and sound grenades. Dozens of youths also suffered effects of teargas inhalation during the clashes. Meanwhile, Israeli policemen arrested Monday afternoon Imam (preacher) of al-Sahaba Mosque Samir al-Elmi after violently breaking into and searching his house in Sawwanah neighborhood. A lap top, mobile phones, a tablet, and important files in addition to an amount of cash money estimated at US$2,390 were confiscated during the raid, family sources affirmed to Quds Press. Another young man was arrested for allegedly throwing stones at Israeli military vehicles which stormed Issawiya town. 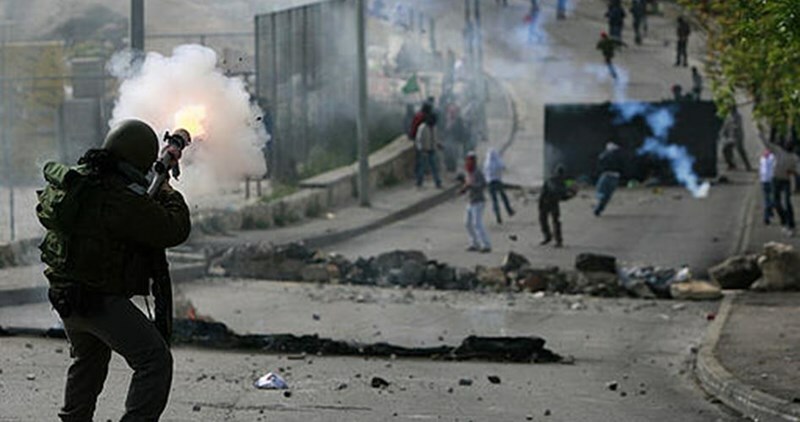 Seven Palestinians were injured with rubber bullets during similar clashes that broke out in Issawiya town on Sunday. Dozens others choked on tear gas. Head of the Islamic Movement in 1948 Occupied Palestine, Sheikh Raed Salah, warned of secret Israeli excavations beneath the holy al-Aqsa Mosque as part of intents to hold sway over the site. Q-Press Media Center quoted Sheikh Salah as saying that many Israeli excavations are being carried out beneath the al-Aqsa Mosque. “Such excavations are crimes against the al-Aqsa and they can only be stopped by ousting the Israeli occupation,” said Salah. He warned of an Israeli shift from a secret phase as regards excavations to a public and unabated stage. “I’m most worried that the Israeli occupation authority would announce its intents publicly and think the moment has come to start the construction of the alleged temple mount on the ruins of the al-Aqsa place of worship,” Salah said. “Never ever shall such a sacrilegious scheme see the day,” he further vowed. 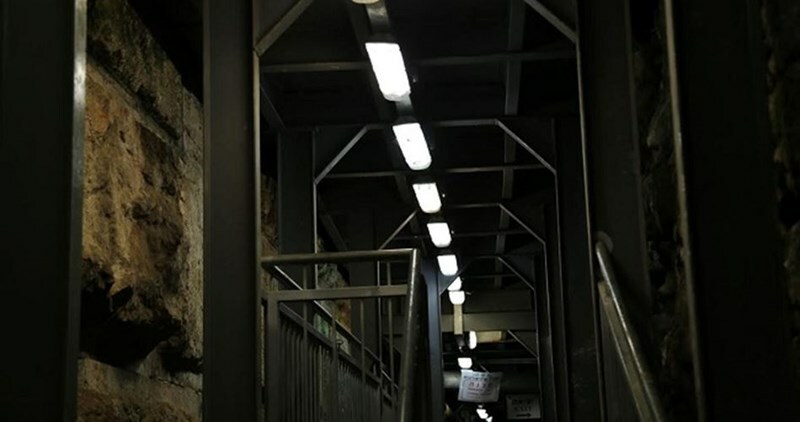 Israeli archaeologist Gideon Sulemani from Emek Shaveh organization also said as he commented on a documentary movie entitled “Beneath al-Aqsa” that excavations are carried out along the Wadi Helweh underground tunnel and underneath al-Aqsa western wall. The situation is alarming ... for the site is very old and there is a possibility that new excavations will lead to the underground corners of the al-Aqsa Mosque,” Sulemani warned. A so-called “Beneath al-Aqsa” movie kept record of the striking surge in Israeli excavations beneath and near al-Aqsa, Muslims’ third holiest site. Israeli soldiers demolished, Monday, a Palestinian home in Jabal al-Mokabber village, southeast of occupied East Jerusalem, without a prior notice. The Wadi Hilweh Information Center in Silwan (Silwanic) said the soldiers invaded Jabal al-Mokabber, and forced the family out before demolishing their property. Abdul-Basset Abu Rmeila said he built the home with bricks, five months ago, and recently moved in with his family. Abu Rmeila added that he lived in the property with his wife, and his four children; the oldest of them is 25 and the youngest 14. 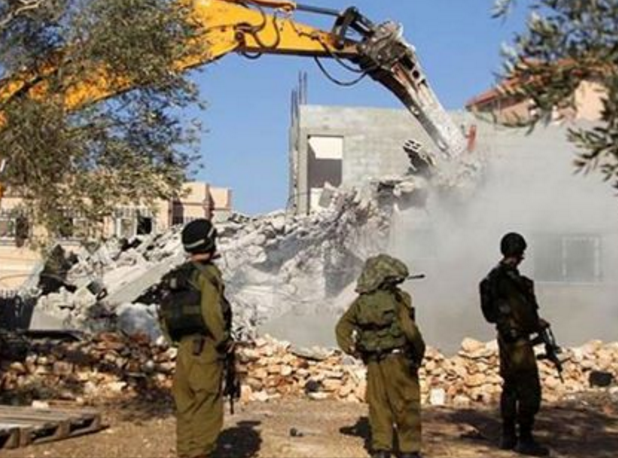 Israeli soldiers invaded, on Monday morning, Khirbit al-Marajem village, south of the northern West Bank city of Nablus, and demolished three Palestinian homes. Many Palestinians suffered the effects of tear gas inhalation. Ghassan Daghlas, a Palestinian official in charge of Israeli Settlements file, in the northern part of the occupied West Bank, said many Israeli armored vehicles and bulldozers invaded the village, after surrounding it, and demolished three homes. Daghlas added that one of the demolished homes belongs to Jamal Tawil, and the two other homes belong to Hisham Jadrawi. The Israeli army claimed the three demolished properties were built without obtaining permits from the "Civil Administration Office," run by the military in the occupied West Bank. Medical sources said many Palestinians suffered the effects of tear gas inhalation, after the soldiers fired many gas bombs during clashes that took place following the invasion and destruction of property. 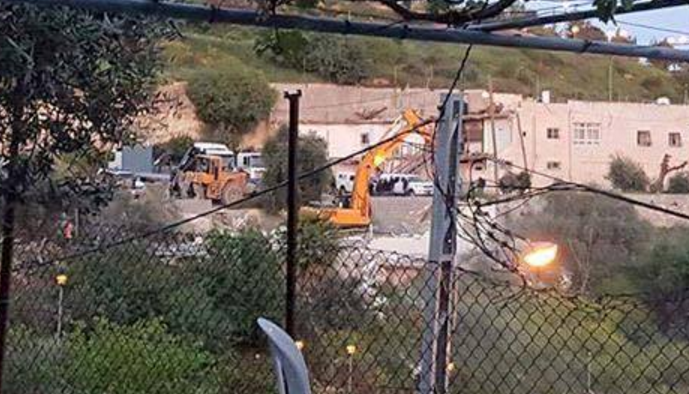 Several Israeli army vehicles, and bulldozers, invaded on Monday morning Khallet Ein al-Hamam area, in Surif town, northwest of the southern West Bank district of Hebron, and demolished a Palestinian home. Eyewitnesses said the soldiers surrounded the area, before several army vehicles and bulldozers invaded it, and demolished a home belonging to Majdi Mahmoud Eghneimat, rendering him and his family homeless. The army claimed the destruction of the property was carried out because "Eghneimat built his home with without a permit from the Israeli authorities." 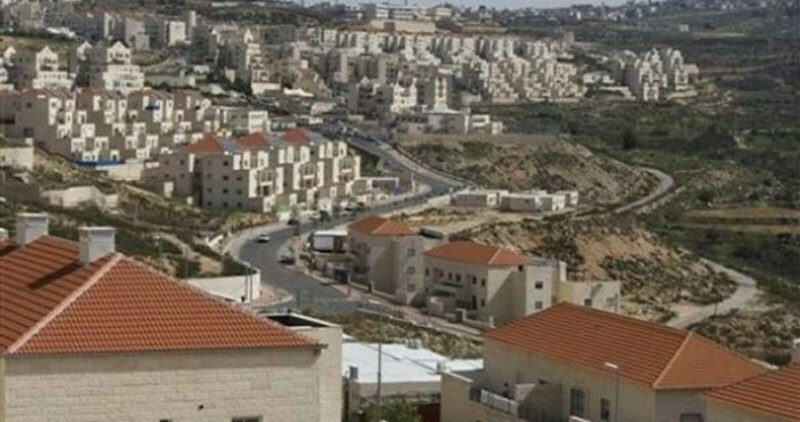 Mohammad Lafi, the mayor of Surif, denounced the Israeli violations and escalation against the Palestinians in the town, especially in Khallet Ein al-Hamam, as Israel is trying to illegally confiscate more lands for the construction and expansion of its illegal colonies. Lafi voiced an appeal to local, regional and international, legal and human rights groups to intervene, and end the Israeli violations and crimes. The Israeli Occupation Forces (IOF) demolished on Monday three homes of three Palestinians suspected of carrying out anti-occupation attacks in Qabatia town in Jenin. Local sources affirmed that Israeli forces stormed the town in large numbers and surrounded the homes of the three martyrs Ahmad Abu al-Rub, 21, Mohammed Kamil, 20, and Ahmed Zakarneh, 22, before starting the demolition process. Violent clashes broke out throughout the town during the demolition process, the sources added. Two young men suffered gunshot injuries during the clashes while five others were hit and injured with rubber bullets. Eyewitnesses affirmed that nearly 300 Israeli soldiers stormed the town and participated in the demolition process after forcing the three families to evacuate their houses in few minutes. Another Israeli force in civilian clothing arrested a young man during the confrontations, according to locals. On February 3, three Palestinian youths from Qabatia town were shot and killed for allegedly carrying out anti-occupation attack in occupied Jerusalem. Since Oct. 2015, Israel has stepped up punitive home demolitions as a means of punishing the families of Palestinians who allegedly carried out attacks against Israelis or were suspected of such actions. Badran warned that such punitive measures will add fuel to the fire, calling on Palestinian people to support the families whose homes were demolished. 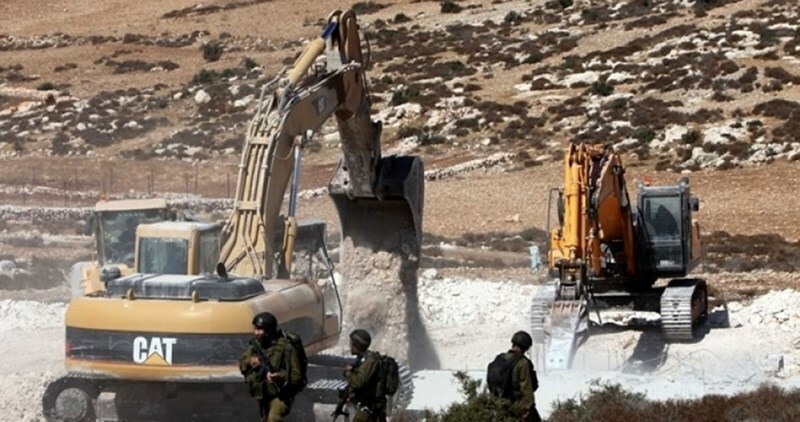 Israeli settlers leveled lands of Palestinian inhabitants of Hares and Dierestia towns in Salfit governorate for the establishment of new settlement units in the vicinity of Rafafa outpost. Eyewitnesses told the PIC reporter that settlement expansion works are focused in the northeast side of Rafafa settlement. Researcher Khaled Maali said that settlement expansion runs contrary to the international humanitarian law and Article 49 of the Fourth Geneva Convention. 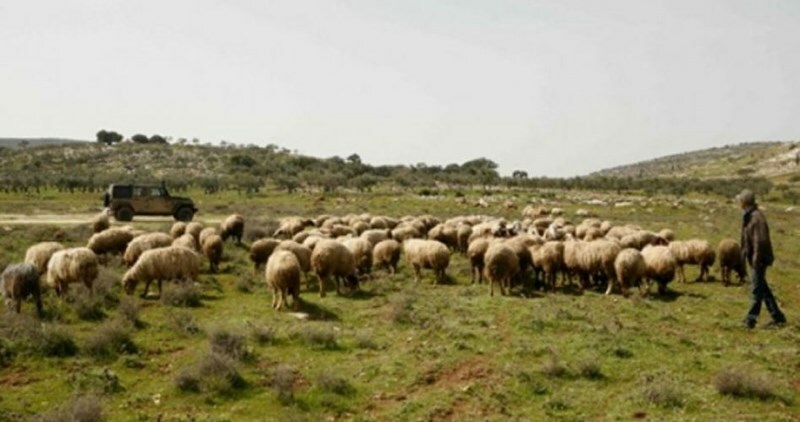 The Israeli occupation authority (IOA) on Sunday confiscated a flock of sheep in Masafer Yatta area, south of al-Khalil. Anti-settlement activist Rateb al-Jabour told Quds Press that employees from the Israeli civil administration and the nature and parks authority confiscated 120 heads of sheep in Masafer Yatta belonging to the citizens, Jihad and Yousuf Ismail. He added that the sheep were taken to the 1948 occupied lands, pointing to the possibility that heavy fines could be imposed on the owners at the pretext they were herding their livestock in a restricted area. Israeli soldiers on Saturday evening stole a sum of money from a Palestinian civilian at a military makeshift checkpoint located southwest of Jenin city. According to WAFA news agency, soldiers intercepted Rami Abu Ghalyoun, a resident of al-Bireh city, at a roadblock near the intersection of Arraba town and stole 1,800 shekels from him. Abu Ghalyoun lodged an official complaint about the incident with the Palestinian Authority security liaison office after he arrived in Jenin. In a separate incident, the Israeli occupation forces (IOF) kidnapped on the same day a Palestinian young man at the entrance to Yabad town, also south of Jenin. His identity is still unknown. 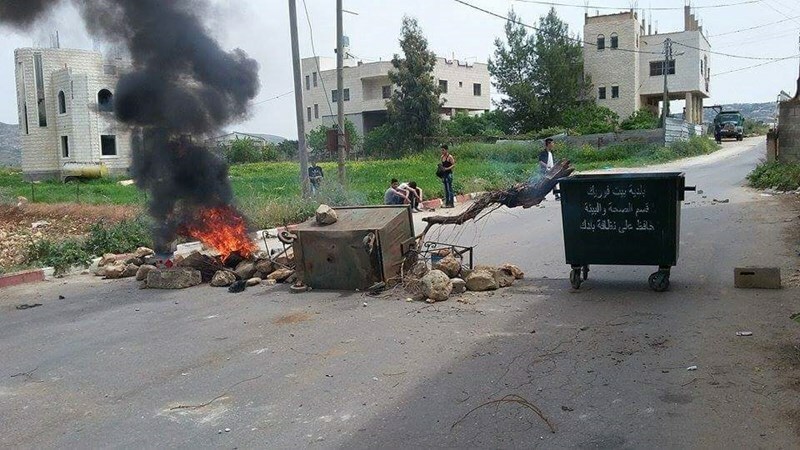 IOF soldiers also set up a roadblock at the entrance to Yabad town and clashed with local young men. Local sources said that several young men suffered from inhaling tear gas during the clashes with the invading troops. The United States is "concerned" about Israel's demolition of Arab buildings in East Jerusalem and the West Bank, a State Department spokeswoman said on Friday, adding that it raised questions about Israel's commitment to a two-state political solution to the Palestinian conflict. Israeli forces bulldozed a school in the Bedouin village of Khirbet Tana in the West Bank early in March, leaving 23 children with nowhere to study in the community overlooking the Jordan valley. The school had been built by the European Union in an effort to help the community of about 40 families. After destroying the school, the Israeli forces returned two weeks later and demolished 17 homes, 21 pens for sheep, goats and chickens, and five outhouses, according to B'Tselem, a left-wing Israeli nongovernmental organization. "These actions are indicative of a damaging trend of demolitions, displacement and land confiscation," spokeswoman Elizabeth Trudeau told a State Department briefing. She said Washington was "concerned" and the demolitions, coupled with continuing Israeli construction and settlement activity "undermine the possibility of a two-state solution." "They also call into question the Israeli government's commitment to that two-state solution," Trudeau said. The State Department previously made similar comments. So far this year, Israeli forces have destroyed or dismantled around 400 homes and other structures across the West Bank, more than in the whole of 2015. Israeli forces also confiscated 579 acres (234 hectares) of Palestinian land near the city of Jericho in the West Bank, a step the State Department also criticized.